Choosing my favorite clematis is akin to choosing a favorite child. If I must, the choice depends upon the hour, the mood, the day before. More generally, I like my own children best, and I like herbaceous clematis the best of the genus, which is odd, since I virtually hoard climbing plants, yet herbaceous clematis are, by definition, the non-climbingones. These are the drapers, the sprawlers . . . teenagers on chaise lounges. Growing only two to six feet tall, herbaceous clematis establish a sense of harmony in a garden: combined with other plants, they form a cohesive picture that is so much more elegant, so much more creative, than the sum of the parts. They are, like most of us, fine on their own but far better in relationship. Most people are initially drawn to one of the climbing clematis, a smashing velvety purple Clematis jackmanii, for instance, adorning a trellis with five-inch flowers. In my case, it was a pale pink C. montanagraciously smothering an old wooden archway. At some point, gardeners encounter the subtler clematis—the quieter, less obvious brother that you eventually want to marry. I first noticed this transition in my nursery, where I specialized in climbing plants. When I started, clematis were just gaining in popularity here in southwestern Canada; within three years, the situation changed. Two herbaceous clematis, C. integrifolia ‘Rosea’and C. recta‘Purpurea’, became the runaway bestsellers. Most herbaceous clematis flower for at least two months, some for even longer (more than many of the climbing clematis). I plant mine about twelve to fifteen inches from the base of a “supportive neighbor.” By mid-summer, you cannot tell where the clematis originated. They are a flexible lot: you can use one in a big container, to cover a tomato cage, paired with a large-flowered climber, woven (to ensure it goes upright) through a trellis, or in the midst of a border. If I were new to this group, I would start by using them to complement roses. Think of the quietly sturdy roses. In June, the rose begins to bloom; the fragrance smells even better than you remember from last year. Then comes early July; the rose begins to slow down, and you must remove the spent blooms if you care to keep it looking its best. Suddenly, seemingly out of nowhere, deep purple flowers distract your eye from the faded roses (and minimize your need to deadhead) as the clematis gracefully adorns the rose. You have a new look and a much longer period of bloom in the same space. Such is the impact of herbaceous clematis. There are no red or yellow herbaceous clematis, but the range within blue, purple, pink, and white is extensive. My current favorite among the blues is Clematis xdiversifolia‘Blue Boy’. It is likely still flowering in November. What more could I want? The hybrid species epithet, diversifolia, is the botanists’ name for all of the crosses that arise between C. integrifoliaand C. viticella. One of the things I like about plants, and children, is that the same two parents can create different offspring. The children of viticellaand integrifoliaare varied and quite exceptional (like one of those families where all the children excel at everything). ‘Blue Boy’ has silvery blue (some say steel blue) four-inch-wide flowers that nod; they begin as drooping bells, but the tips of the four sepals (the colorful petal-like parts of each clematis blossom) bounce up and flare out—bellbottoms in a floral form. If stretched out taut, the stems of ‘Blue Boy’ might reach five feet; they wander about in the border and flower prolifically. Three-foot-tall stems start the floral show in late June and proceed to bear new flowers through the rest of the summer. Mine traipses through a white Rosa‘Blanc Double de Coubert’, which flowers in June—and June only—a gawky six-foot shrub that looks at least as good with the silvery blue flowers as its own white tissuey ones. ‘Blue Boy’ is an attractive and sleek herbaceous clematis, one of those plants that knows its own mind but does not often reveal it. I’m just glad it shows up. Clematis xdurandiiis the easiest to obtain of all herbaceous clematis, and to see it is to want it. I was once enjoying a beautiful formal garden with a group of overly serious gardeners when we came upon Rosa‘Perle d’Or’, an elegant pale pink shrub rose with stems that rise up to four feet and then extend gently outward, as if to reveal a manicure. There, woven through the rose stems, was C. xdurandii, equally tall, leaving ‘Perle d’Or’ upstaged and the articulate gardeners speechless. Like a tall, slim, stylish woman in a simple velvet, floor-length dress, the flowers of this clematis are a textured indigo blue with yellow centers. The four-inch flowers lie flat and have ridges in their sepals that add to the impact. The sepal tips end in sharp points, which accentuate the sleek line; the simplicity is intimidating. But C.xdurandiiis simple to grow; flowers appear in late June and on and off throughout the summer, entwining itself effortlessly, resting its flowers intentionally. It is not the most floriferous, nor even the longest flowering of the herbaceous clematis, but, in unadorned elegance, it is unsurpassed. 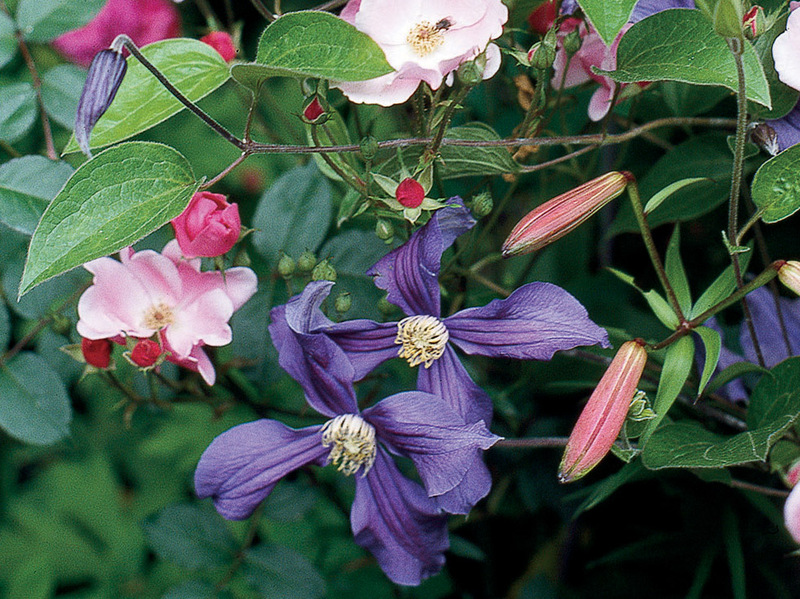 Turning from blues to purples, we find Clematis‘Arabella’ unabashedly stealing the show. The late Christopher Lloyd, gardener and clematis grower extraordinaire, stated emphatically that this is the longest flowering of allclematis. ‘Arabella’ begins to flower in May and is still at it in November. I assume that, by late fall, ‘Arabella’ is tired, but up she comes the next spring as spunky as ever. ‘Arabella’ is a bright blue purple, with a touch of grey, but she is still the cheeriest of the purples. A cross between C. integrifoliaand an unknown partner, this chance seedling’s flowers lie flat, with spiky stamens of creamy yellow, and always with five sepals, each touched by a subtle rosy-colored bar down the center. The stems extend to five feet, but as they wind their way about, you would never think them to be so long. In my garden, ‘Arabella’ weaves into one of my few hybrid tea roses, Sunset Celebration (‘Fryxotic’); its warm apricot flowers begin in late June, and the contrast with ‘Arabella’ wows me for about two weeks. Then ‘Arabella’ comes into her own as she lengthens, sags, and lies down with a catmint (Nepeta) surrounding the base of the rose. The catmint and ‘Arabella’ could be color twins, so identical in hue are both their sepals and their stamens. Yet it is not the color, but the scale, the juxtaposition of the small-flowered catmint with the larger-flowered clematis that makes the combination exceptional. Among the pink-flowered are lots of good choices: shell pink, deep pink, saucer-shaped flowers, and tulip-shaped flowers. ClematisInspiration (‘Zoin’) is a warm, sugary pink; the three- to four-inch flowers of four sepals have a slightly paler midrib, almost like a shadow, and cream-colored stamens. This is the Hallmark card of herbaceous clematis, the adorable, much younger sister who inspires everyone to speak nicely. Reflecting its hybrid origin, Inspiration picks up the non-climbing habit and color of C. integrifolia‘Rosea’, and the flat openness of the flower and four- to five-foot height of C. ‘Warsaw Nike’. Inspiration is perfect as a color echo for Lavatera‘Rosea’ or Rosa‘Pink Pavement’. Or, place Inspiration next to a dwarf conifer; pink clematis make conifer foliage appear lusher, bluer, more lighthearted. Last summer’s favorites were Clematis‘Alionushka’ and C. ‘Hendryetta’, two pinks that proved quite similar. “Hendryetta’ is a deeper pink, but my allegiance is to ‘Alionushka’ for its soft pink flowers, reminiscent of a lovely bridesmaid in soft satin. The exquisite flowers remind me of its C. integrifoliaparentage, but the larger flower size and color come from a less famous parent, C. ‘Nezhdannyi’. ’Alionushka’ has three-inch-long sepals that twist, like a skirt twirling about your knees; the depth of the curve gets more pronounced as the flower matures. Use ‘Alionushka’ by itself; it has enough presence and height (four to five feet) to cover a support of its own, and not look like it won’t hang properly on the hanger. If that sounds risky, try ‘Alionushka’ through a hydrangea—preferably a pink or white one—or try her through one of the early honeysuckles, such as Loniceraxpurpusii, where the color and scale of the leaves provide the perfect frame. You can cut back both the honeysuckle and the clematis in March, simplifying the maintenance for both. There are some appealing white herbaceous clematis. My two choices are easy to obtain, but don’t think they are any less valuable. Clematis integrifolia‘Alba’ is a random seedling (now propagated by division) with pure white blossoms. When grown in full sun, it seems to have a bit of fragrance—curious because the blue-flowered species has no fragrance at all. The plant stands no more than two feet tall with nodding white, waxy, bell-shaped flowers; the sepals twirl outward, flare briefly, and end in a sharp point. A subtle ridge runs along the sepals, creating a prim appearance. The overall effect is one of delicacy, but fear not: this plant is sturdy. Beginning in June, mine twines its stems up a RosaWhite Meidiland (‘Melcoublan’), a sturdy three-foot-tall rose that flowers for much of the summer; the two complement each other beautifully. I recently saw it growing into a shrubby scented geranium (Pelargonium)—a surprising combination but quite appealing. A taller version of this is Ray Evison’s C. Gazelle (‘Evipo014’). The tycoon of clematis breeding, Evison is unwilling to reveal the parentage, but Gazelle rises to four or five feet and is great for growing into larger shrubs. In my garden, Gazelle scampers up Hydrangea paniculata, with its great white panicles. In this duo, the clematis flowers first and thenthe host shrub blooms in August. The younger sister in me particularly likes this; so often, the bigger sibling goes first. I think Gazelle will become more widely available in the near future, thanks to Evison’s marketing efforts. The second of the herbaceous whites is a different species altogether. Clematis rectaemerges in May with the most elegant rosette of leaves of almost any clematis. It is worth growing for this initial show alone—bluish green, simple leaves, intertwined like a young Greek’s crown. This rosette reaches perfection, ironically, just before it flowers in early July. The flowers are small, white, four-pointed stars, no more than an inch across. This is one of those enabler siblings that weaves its strong-minded brothers and sisters into something more cohesive than they were individually, but it does so deftly, in a subtle manner. In a sunny site, with a good plant (buy your plant in flower), C. rectacan have a sweet hawthorne scent. Sadly, once this plant begins to flower (at about three feet in height), its stems elongate further, and the whole plant flops, burying one or two of those siblings it worked so hard to unify. Despite the flop and mess, I’m thankful for its prettiness and let the flowers shine for a week. Then, come the first of July, I whack the entire plant to the ground—a drastic measure but surprisingly satisfying on a bad day. I make a huge bouquet for the kitchen that lasts at least seven days (if you place the stems in boiling water, they last longer), and toss the rest of the foliage on the compost. Three weeks later, I have the elegant foliage all over again, followed by a small show of flowers. This time, however, the stems never get as long, and the plant is manageable. In recent years, C. recta‘Purpurea’ has become popular; its leaves emerge deep purple and can be striking through a yellow leaved shrub such as Choisya ternata‘Sundance’ or echoing the foliar color of Vitis vinifera‘Purpurea’. The climbing clematis require pruning specific to each species; herbaceous clematis do not. This group dies to the ground completely, and you can cut their dead stems to the ground anytime between November and March; it can be done later, but be sure to do it before the new foliage appears. They are all hardy to at least USDA zone 4 and perform best in Sunsetzones 2-11, 14-24; snow, wind, and rain do not seem to bother them. The herbaceous clematis will grow well in full sun or part shade, but they do not tolerate sandy soil. Give them a shovel of well-rotted manure or compost in late fall, and maybe a bit more in the spring. I also use rose food, feeding them at the same time I feed the roses, scattering it like chicken feed a few inches away from the crown. I do this once in early April and again about the first of June. There is no more work after that except making sure they get watered; this requires careful attention, as the supporting plant can steal all the water. In writing about my children, I get a panicky feeling that I have left out the best stories. It feels the same with herbaceous clematis. With specialty nurseries and mail order, the selection is varied and appealing. And with herbaceous clematis, you can never run out of places—just cozy them in with others, and watch them improve the relationship.